In the perilous world of kings and queens, one woman matches ambition with loyalty and ruthless intrigue with all-consuming passion in this gripping historical fiction novel. But Whitehall Palace is ripe with ever-shifting alliances and sexual scandal, and Sarah will need all her cleverness to succeed. Titles, power, and wealth are the prizes, while an idle whisper in the wrong ear can bring a cry of treason, and the executioner’s ax. Will Sarah’s loyalties—and her dreams—falter when a king is toppled from his throne and a new queen crowned? And will she dare risk everything when her one true love is tested by a passionate, dangerous obsession? Brimming with the intrigue and sensuality of one of history’s most decadent courts, Duchess brings to vivid life the story of an unforgettable woman who determines her own destiny—outspoken, outrageous, but most of all true to herself. Susan Holloway Scott is the author of more than forty historical novels and novellas. Writing under her own name as well as Miranda Jarrett, her bestselling books have received numerous awards and honors. With more than three million copies of her books in print, she has been published in nineteen countries around the world. 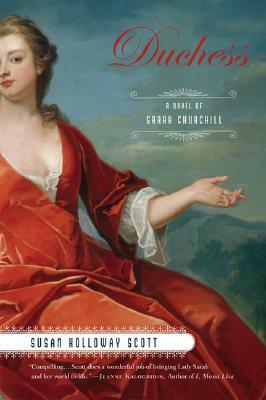 Her most recent historical novels have been set in seventeenth-century England, in the decadent, politically charged court of King Charles II, and all have been Historical Novels Review Editors' Choice titles. She is a graduate of Brown University, and lives with her family outside of Philadelphia, Pennsylvania.